Mike Brown finally gave in. He traded Carson Palmer to Oakland. 2011 marked the year that the Carson Palmer era began in Oakland. It wasn’t the prettiest quarterback performance we’d ever seen. But to be fair, he didn’t have OTAs, a training camp, or a pre-season. So should we really conclude his value by looking at a 10 game sample? Probably not. Which is partially why Carson has some positive fantasy worth this year. With talented wide receivers like Darrius Heyward-Bey, Denarius Moore and Jacoby Ford, Palmer’s got what he needs to be successful. Add in the explosive Darren McFadden, and the Raiders offense becomes, potentially, one of the most fun to watch in the NFL. Carson Palmer. 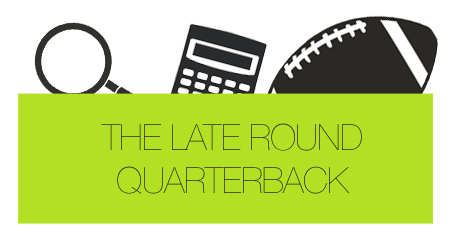 The logic here stems back to the concept of the late-round quarterback. When you’re drafting in the 11th round, you shouldn’t be looking for a player that will give you 11th round value. What good does that do you? He’ll just sit on your bench all year. It’s why I’m not getting players like Andy Dalton or Joe Flacco this year. Flacco has historically finished as the 14th or 15th best quarterback in fantasy, and Dalton doesn’t have enough around him for me to think he’ll be a top-10 quarterback. Yes, he has AJ Green and Jermaine Gresham, but there’s not much after that. Elite talent doesn’t simply create a top fantasy quarterback. Look at Kevin Kolb or John Skelton. Great depth does. That’s why Palmer has potential. He has a great group of receivers, and a running back that can catch the ball out of the backfield. He’s a value pick as the 13th or 14th pre-season ranked quarterback. Darren McFadden. I know he’s a walking hospital, but in 13 games in 2010, McFadden had 1,664 all-purpose yards and 10 touchdowns. He was still the 6th ranked back, and if he would’ve kept up his pace over 16 games, he would’ve finished 2nd only behind Arian Foster. He, even more so than Carson, has crazy fantasy worth. If he’s healthy for the entire season, he will finish as a top-5 back. Now, I understand he’s never done that, but that’s the risk involved with him. And that’s why he’s not always being drafted in round one. Before you jump down my throat and remind me that I’ve talked down Michael Vick due to his injury-proneness, remember this: Michael Vick, when healthy, is unbelievably overrated. As I’ve shown before, even if he finished the entire season last year, he would’ve been the 7th ranked quarterback. In a 10-team league, that’s the 30th percentile. A lot of fantasy owners will be reluctant to draft McFadden. If he slips to the second round, you could have a potential steal. Denarius Moore. No, Darrius Heyward-Bey. Ah, nevermind – Denarius Moore. I just don’t know! It’s clearly down to those two guys, but it’s a legitimate toss-up in my eyes. I’ve heard Moore be compared to Randy Moss. And I’ve also heard him compared to Mike Wallace. I’d probably go with the latter, but regardless, you’re seeing that many believe he has unbelievable potential. Last season, Moore finished 4th in the NFL in yards at the catch. This season, if Carson can get the ball downfield, Moore could be poised to have a similar second-year breakout season similar to Mike Wallace. But on the other side of the ball, Darrius Heyward-Bey finished his season strong. He’s going to get more targets than Moore, which I typically favor, and doesn’t always draw defenders’ best cornerbacks. Point DHB. I’ll leave this debate up to you all to discuss. I can’t choose. And because of that, I may not own one of them. But if you draft the right guy, you may get a starter. Useful. This team has a multitude of players that are being drafted lower than their talent levels. Carson Palmer, albeit older now, has been at the top of the fantasy world before. His receivers are young, and I could see one of the two starters (Heyward-Bey and Moore) finish the season as a fantasy starter. And lastly, Darren McFadden is back. Even if he gets hurt, which appears to be probable given his past, McFadden can win you games. It’s worth it if he drops in your draft due to his risk.